Tom Yum ( a spicy and fragrant thai soup) is one of my favourite dishes ever. I recently bought the Mildred’s Cookbook and I thought I’d try out their Tomato and Mushroom Tom Yum – it turned out with a lot of depth and flavour, totally delicious! I followed their recipe very closely and just added a little bit more chilli (I love hot food so if you don’t just add less) and lemongrass as I like my Tom Yum super fragrant and lovely. Basically you make a broth and then add the chopped tomatoes and (cooked) mushrooms to it – it’s very easy. Sometimes I like to have Tom Yum with rice which makes a nice light meal. Using a spoon remove the seeds from the tomatoes quarters. Set the seeds aside and roughly chop the flesh. Heat a glug of the sesame oil in a large saucepan. Add the onion, garlic, chillies and galangal (or ginger) and cook until the onion had softened slightly, about 2 or 3 minutes. Add the lemongrass, tomato seeds, coriander stalks and lime leaves and sauté for 5 minutes, until fragrant. Add the tamarind paste (or lemon juice), sugar and tomato puree and give everything a good stir before adding the stock. Bring to the boil then reduce the heat and simmer gently for at least 20 minutes to allow the flavours to infuse. Season to taste with salt and pepper. In another saucepan, heat a splash of oil over a medium heat, add the mushrooms and cook until just tender. Strain the broth through a sieve and put it back in the sauce pan. 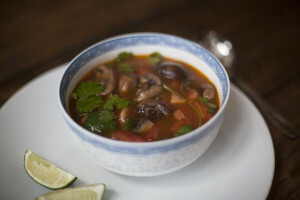 Add the cooked mushrooms, chopped tomato flesh, coriander leaves and lime juice to the broth. Ladle into bowls and serve immediately. What The Hell Do Vegans Eat? All images, recipes, and content are Copyright 2013. Do not reproduce any image, recipe, or content without written permission.